Hey Area: You ask, we answer. Future civic leaders: Ivan Garcia, a youth activist in Oakland, and his sister Ivoneth. Ivan Garcia is only 15 years old, but he’s already working with Oakland city officials, and was appointed by Mayor Libby Schaaf to the city’s Youth Advisory Commission. Youth Activist Ivan Garcia / Sights & Sounds of East Oakland 2018 from KALW News on Vimeo. At City Hall in downtown Oakland a crowd of about fifty protesters, mostly teens have gathered for a march. They’re there to protest a proposal to transport coal through West Oakland. Ivan is in his comfort zone speaking out. Not only is he involved with this coal protest, but he’s also active in movements to combat youth homelessness and environmental degradation. Ivan also has his own YouTube channel, which ranges from teenage antics to political statements, such as “Dear Mr. Trump,” a video letter to the president that he made with his 8th-grade class immediately after the 2016 election. He’s the first in his family to get involved with issues like this. “My mom is not into politics, no one in my family ... truly has a big passion for politics,” he says. “It’s been this really exciting journey to immerse myself into something so new to me." Ivan also makes it a priority to participate in youth-led movements — such as this anti-coal march today. “Having youth in our day-to-day life is one of my big things, so we can organize specifically as young people,” he says. This past year, Mayor Libby Schaaf appointed Ivan to the Oakland Youth Advisory Commission of the City Council, where he’s a part of the Environmental and Sustainability committee. Mayor Schaaf shows up at the end of the coal rally and addresses the young protesters. Afterwards, she sings Ivan's praise. “I love Ivan,” she says. “He's a leader. I can't wait for him to sit in my office. And I mean in the desk, be the mayor. He's going to be an amazing mayor,” she says, putting her arm around his shoulder. The impact of coal on the health of the community, homelessness, the environment are all vast and substantial issues for anyone to add to their civic work, but imagine if you had algebra homework and a term paper on top of that. "All the things I do are obviously to give my sister a better life, and to create more meaningful social change in my community." Ivan’s still just a high-school freshman — but even at school he walks his talk. We walk around campus and he shows me how it all works, by picking up a used yogurt cup laying on the ground. Ivan explains that you tag the litter by type or brand name, which creates a digital landfill. The collective data could help companies find more sustainable approaches. Ivan attends Head-Royce, a private school in the Oakland Hills. He transferred from public school, and in some ways, it’s been a challenging transition. Ivan says his family is a big reason he can be so active in his political and social work while still being in high school. “If it wasn’t for them actually pushing me and encouraging me and telling me I can do what I want to do, I wouldn’t be where I am today,” he says. Ivan’s grandmother immigrated to the United States when she was a little girl. The strength of his family inspires him to make them proud. As the protesters start to leave the anti-coal rally, Ivan’s mom and little sister arrive to pick him up. 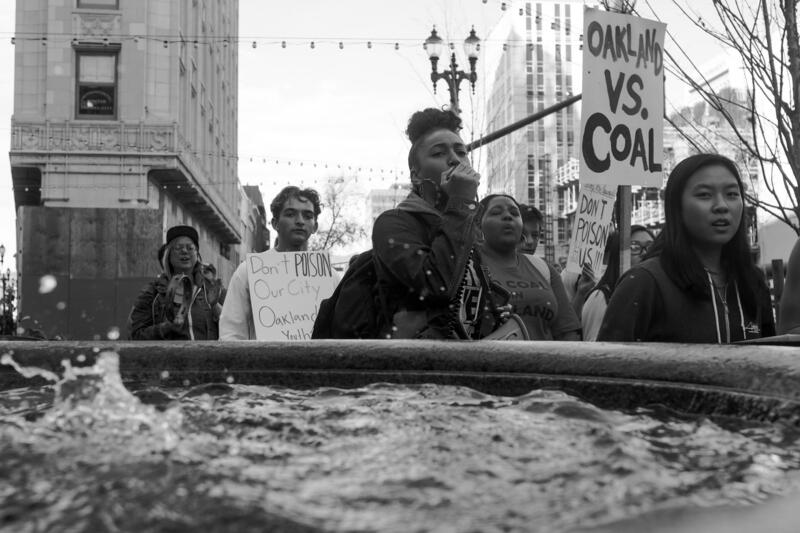 Oakland youth rally against a plan to transport coal through the city. Ivan’s pursuits keeps his mom, Laura, busy. And after a long week working at a recycling center in Hayward, she tries her best to keep up with his changing schedule. Laura says she’s learned a lot through Ivan’s political work. She says he teaches her a lot about her hometown, Oakland. He's also inspiring the next generation of activists — his 9-year old sister, Ivoneth, thinks his work is really cool, too. “I want to follow his footsteps!” she says. So what happens now, after a day of school and marching against coal coming to West Oakland? Ivan’s going to go home and do his homework. That story was produced as a collaboration between our Hey Area crowdsourced journalism initiative and the community media training program Oakland Voices. It was recently presented as part of our live event series Sights & Sounds of East Oakland. What have you always wondered about the Bay Area? Ask Hey Area below. Girls of color who attend Oakland Unified schools don’t feel safe from sexual harassment or assault. That’s according to a report commissioned by the district. An East Oakland warehouse is ground zero of a unfortunate standoff between art and marijuana. Over 30 artists are facing possible eviction, after a cannabis investment fund bought their building—one of Oakland’s oldest live/work artist housing.